Congress in Tripura on Thursday took out ‘Akrosh rally’ in protest against bulldozing of its party offices built on government lands. The eviction drive was launched on May 7. The protest rally christened as ‘Akrosh rally’ was led by state president Birjit Sinha. Former legislator Gopal Ray and other top rung leaders of the party took part in the rally. Police arrested over hundreds of Congress members during the protest rally. Introspecting on the poor performance in the last Assembly elections, the Congress leadership also decided to strengthen the party ahead of the Lok Sabha and other elections. State president Birjit SInha said the BJP regime has bulldozed democracy and opposition supporters and members are now at the receiving end. The Congress has alleged that the BJP-IPFT coalition government in the state has been demolishing party offices with political vendetta and without prior ‘legal’ notice. It has dubbed the BJP-led government’s functioning in Tripura “worse than the British rule”. “Within two months of assuming office, the Bharatiya Janata Party-led government bulldozed 60 to 70-year-old Congress offices in Agartala,” Sinha said. 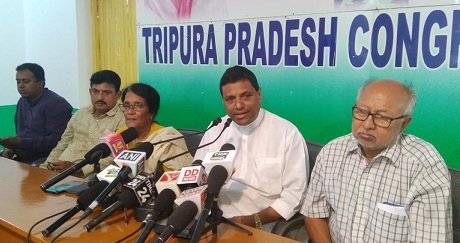 Trade union offices affiliated to various political parties including ruling BJP, Congress and CPI-M were constructed illegally on the government lands in Tripura.